Looking west from a section of Essex Street. That big tree is one of several proposed to be cut. 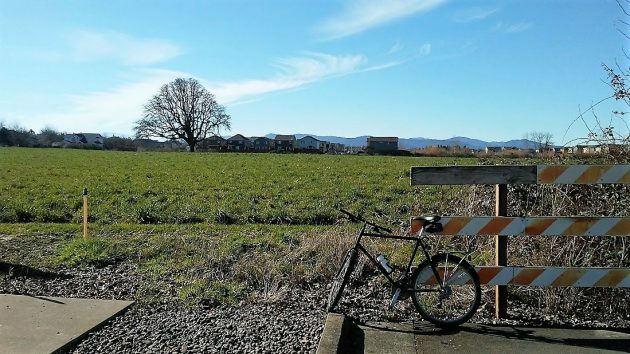 The Albany Planning Division has received a tentative plat for a 148-lot subdivision that would cover most of 47.5 acres of open field in North Albany and require the felling of 22 trees including three big old Oregon white oaks. Given the proposed layout of streets and houses, the oaks can’t be saved because too much of the canopies and root zones would have to be removed, which would be detrimental to their health. So the developer’s arborist recommended their removal, David Martineau of the Planning Division told me. Albany’s review criteria for tree removal are not strict enough to prevent those specimens to be felled. Still, a different arrangement of the home sites could presumably allow these large oaks to remain and become points of interest and beauty in the future neighborhood. 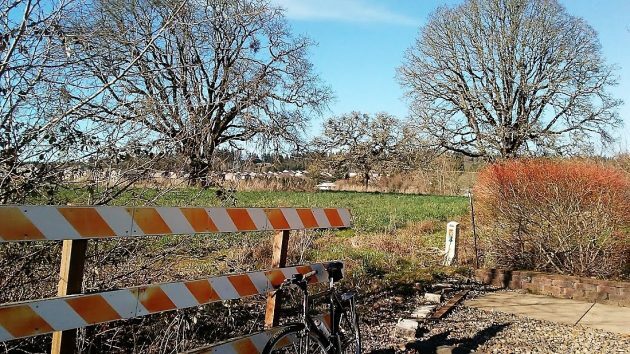 As proposed, the developer, Hayden Homes, plans to set aside about 12 acres of “significant wetlands” along with three other parts of the property as natural areas. The property is north of Dover Avenue and west of Crocker Lane. Property owners within 1,000 feet of the site were being notified of a public hearing on the application before the Albany Planning Commission. It will be held at 5:15 p.m. March 5 in the council chambers at City Hall. More information including a map of the development is available on the Planning Division’s website here. As of Tuesday night it was the top item on the list. Housing developments, of course, are the reason North Albany is projected to have a population of more than 8,000 by 2020 and nearly 11,000 by 2040. That’s up from 5,100 in 2000. Looking northwest across the land proposed to become the 148-lot Pheasant Run subdivision. In the distance, Benton Woods. This makes me want to cry! I live across the street and have had the pleasure of gazing at one of those white oaks for the past 15 years. I think this is a travesty. I may just have to chain myself to the tree. We always knew that the field would be come houses but were hoping the developer would do something nice for the neighborhood. Unfortunately like the government and capitalists money is more important than preserving space and beauty. It’s even worse than you probably expect. I was talking to a worker at the new subdivision on North Albany road just past the traffic circle about how close together the new houses are. He told me the CITY requires them to be that close. A contractor HAS to build them that close. It’s 5 feet between single story houses and either seven or eight (I forget which) between two story houses. By the time you put up a fence, which I would being cheek by jowl with a neighbor, you could touch your house with one hand and the fence with the other. I find that rule foul and disgusting. When did the city make that rule? You have to see it to believe it. They just want MORE PROPERTY TAXES. More houses more taxes. I would NOT buy a house like that no matter how nice the house. This is Oregon, not Southern California. Do it! I’ll bring the snacks. It will be fun! Surely there are community meetings scheduled for the immediate neighbors? Pressure can be put on the city and developer to redesign the layout to save the trees. The design is only on paper at this point. Makes me want to cry, too! This whole area is known as Oak Grove community. It was once filled with white oak and now one must search to find one. When Oak Grove School is torn down and rebuilt it is my guess that the very few trees left there will be lost. More progress. Perhaps it’s time to re-consider the roundabout at Crocker? A traffic signal is just going to make the backup on Crocker absolutely atrocious after another 148 homes try go get to onto Gibson Hill every day. FYI Since ODFW quit hatching pheasants for release in the Willamette Valley the Ring Neck (China Pheasant) has disappeared from the valley. They were introduced to the valley in the early 1930’s and for many years were a favorite game bird here. Alas, farming practices and crops decreased their concealment areas and their propagation by ODF for valley release was stopped. Our damp climate was not conducive to natural reproduction. For nearly thirty years we were privileged to watch these colorful animals, even to the point that one rooster who was given different names by different families including Ralph the Rooster, Roger the Rooster, Phil the Pheasant, etc. He even took on a cat who was intent on having him for a meal—–the rooster won. I think we can attribute a fair part of the pheasant decline to the increase of Red Tail hawks. Oh, how I hoped that this beautiful field could just remain a beautiful field and let nature be nature. I am saddened to hear about yet another sub division coming into being. Having lived here 21 years, I have watched much of the fields that were once farmed become home lots. I understand progress but when I bought in my neighborhood, it was an already established home in a nice neighborhood and traffic was minimal. Now it takes 20 more minutes to get to town and more cars speeding and our wildlife trying to find their “homes”. What is our ratio of homes that are foreclosed to new homes being built? Do we really need another subdivision? Where are the people coming from that are supposed to live in these homes? This is just insane. I hate it so much. NO MORE NEW SUBDIVISIONS! I understand that most comments will be moot as Hayden Homes and this project are simply too big. Hayden Homes has enough lawyers and engineers to respond to and answer all necessary legal requirements to move forward with this project. The sad part to my family is that we chose North Albany due to the lot zoning size and mostly single story home structure. The City often cites the Historic areas of homes, in Albany, as meaningful to community identity, but does not seem to be concerned about trying to retain the perceived identity of NA. The traffic is already a major issue and will only escalate. The City will say that developing Whitmore south to Gibson Hill and Dover east to Crocker are outside the traffic requirements of the developer, but maybe the City should step in and develop those routes to expedite traffic out of the 140+ new homes plus all the existing homes that are required to use Gibson Hill & North Albany, with a minimal number using westward routes. Please keep us updated on progress out there. Considering moving my family up from Eugene. Beautiful location. The city should be required to have all of the infastucture and roads finished ahead of time. No more tiny lots! Also the non stop speeding in North Albany is ridiculous! Gibson Hill St. And Crocker Ln! Leave stuff alone! I didn’t get past the first paragraph without wanting to cry. Maybe it is time to clean house at City Hall and vote out everyone on council on the next ballot and the mayor, too, if she is on the next ballot. I think I’m going to be sick! Rampant and unconstrained development for the sake of a dollar leaves the locals with all of the resulting problems. I hate to say it, Stephen, but North Albany won’t be beautiful anymore! There are currently infill developments, as well as multiple large scale neighborhood developments taking place now that will completely change everything that most of us value here. Add another 148 homes and we might as well live in Portland or Seattle. All of us who are concerned about this proposal need a united front to express valid reasons to the City for altering the plan. Please come to the March 5th meeting prepared to deliver your testimony! I was born and raised in Albany. I was in the first junior class at SAHS. I left for 35 years, came back and was sickened by how Albany has changed. When I graduated in ’73 Albany had 20,000 people. Now look at it! No more subdivisions in any area should be planned. Instead, get those contractors working on remodeling and restructuring existing homes. People in general would like living in updated older homes. I agree that the planning commission should be voted out and people with an environmentally sane point of view voted in. BTW, I live by the roundabout on N.Albany Road. The traffic is horrendous and drivers are rude. Developments are always named after the places they destroy.